In the pink silicon flower cup are small pieces of the above mentioned chicken. 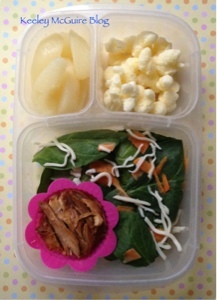 Around is a baby spinach salad with mozzarela cheese and freshly grated carrot. Top right is Pirate's Booty.